Antique/Vintage - Johnson Brothers Ironstone Platter, Historic America / Thanksgiving" Pattern, Made from 1930 thru 1974. Per Back Stamp this Platter appears to have been produced in the earlier years. 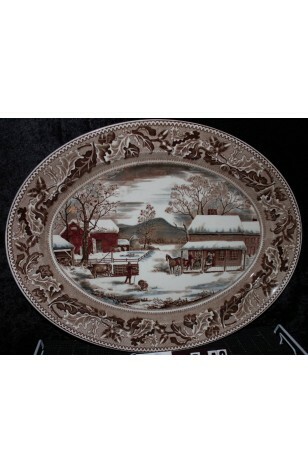 A very large 19 3/4" Oval Ironstone Platter by Johnson Bros. in the "Historic America Thanksgiving Pattern. It is a Farm Scene with early Barns, Horses, Farm Animals and Snow. The Colors of the Platter are Browns, and Rustic Red's, with Gray and Blue Clouds. The Lip of the Platter has a Band of Multi-colored Brown Leaves. The Rim is a White Rick Rack Pattern. A very heavy Piece, and in Very Good Resale Condition unless noted below or viewed in pictures.